Kyle Busch may not be wholly satisfied in his fantastic run of three runner-up finishes in the opening six races of the season, but historians – and fans – can certainly appreciate his effort in the No. 18 Toyota for Joe Gibbs Racing. 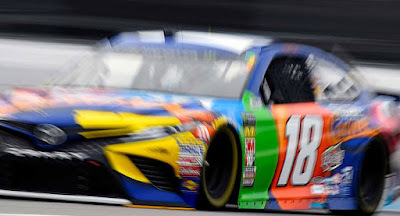 It’s been outstanding enough to give Busch the points lead – by eight points over fellow Toyota driver and reigning Monster Energy NASCAR Cup Series champion Martin Truex Jr. and statistically, Busch becomes only the 10th driver in series history to finish second in three or more of the first six races. He joins Kyle Larson (2017), Kevin Harvick (2015) and his older brother Kurt Busch (2003) as the only active drivers to post such a fast start. NASCAR Hall of Famer Buck Baker set the all-time mark with four runner-up finishes in the opening six races. His son, Buddy Baker, finished second in three of the opening six races in 1971 – and remarkably, was only running part-time that season. The late Dale Earnhardt posted three runner-up finishes in the opening six races – and he accomplished that twice. He did it in 1993 and 1995. Plus, Jeff Gordon grabbed three runner-up finishes in the first six races of the 2007 season. Harvick collected five runner-up finishes through the first nine starts in 2015. He finished second 10 times that season – the most in the regular season since the inception of NASCAR’s Playoffs in 2004. Three drivers have finished runner-up four times during the 10-race Playoff stretch, including Chase Elliott (2017), Jeff Gordon (2014) and Jimmie Johnson (2006).